Plate 24 from the fourth set of Thomas and William Daniell's 'Oriental Scenery', which they called 'Twenty-four Landscapes'. The views progress northwards from the far south at Cape Comorin to Srinagar in Garhwal in the Himalayan mountains. Thomas wrote: 'At this place, which is a little above the city, terminated the author's rout[e] through the mountainous district of Serinagur... 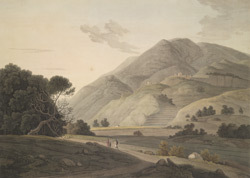 The mountains are here embellished with scattered villages, and their sides with regular horizontal stripes of cultivation, producing an effect not so agreeable to the artistical as to the philanthropic observer, who is much less interested by the beauties of form than by such unpicturesque indications of useful industry'.